First read about the grapes and the grape harvest . In most contries of Europe, the autumnal grape harvest is preceeded by a grape festival or wine festival. The old barrels have to get empty and make space for the new wine... so in some areas, more than a week of rural festivities are celebrated. Words like new wine, wine queen, wine parade and so forth are all kigo in this category. 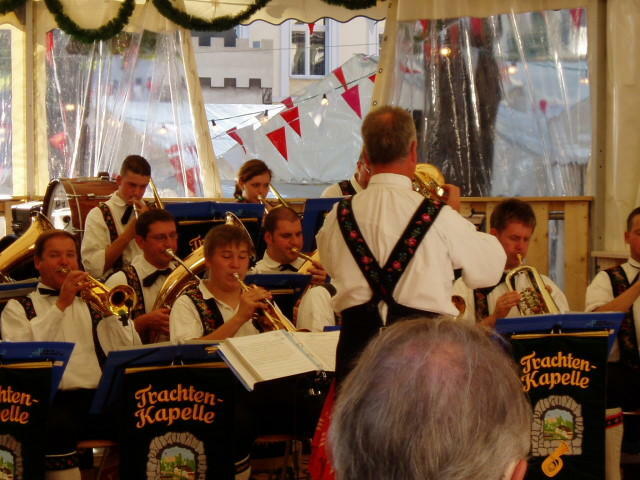 In my hometown in Bensheim, a wine-growing area along the river Rhine valley, there was almost a week of festivities, with a small separate village erected around the market place (Winzerdorf). 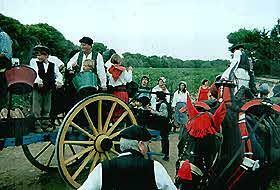 Every night for 10 days, there is dance and merrymaking, eating and of course drinking the old wine. Traubenfest in Xinjiang Grape Festival in Lüyou Guangchang, with the Uigurs. The Fête de Vendanges is a wonderful weekend of festivities, parades, craftsmen and craftswomen plying their trade, folklore, and music, in the village of Ouveillan, about 15 kms from Narbonne, and a similar distance from Beziers. The Fête de Vendanges, of Wine and Crafts takes place every year in Ouveillan in October. It continues an old and much loved custom of the Languedoc. It was called "Dius oc vol" "Se Dius lo vol" or "Se Dius va vol", (What God wanted) - an expression that indicates a harvest feast at the end of the agricultural year. That marked a rite that was lost around about the last war. It was rediscovered in Languedoc: Aude, Arige, Tarn, Rouergue. It was a farewell to when the harvest was finished, a way to express thanks to fellow workers, and to enjoy a year that God had blessed. Towards the end of the harvest it was customary to work at a frantic speed "nos donaran pas solament lo temps de pissar" . Then there was the dinner: solenca, proferta sarda ou acabaira, a great feast offered to laborers, under a shelter or in the cart shed. It was the time for cassoulet with sausage and salt, poultry, legs of mutton. ..and wine. Afterwards during dessert everyone drank heartily of "brlot" - burnt brandy with sugar in large glasses. Everyone was lively, ate more than they should, belched noisily (as was the polite custom to render homage to the generosity of the host) and sang. Singing was then a shout of triumph, - beautiful, free with a wonderful resonance. The peasant enjoyed himself fully, knowing after much work that this was the time to eat and drink to the full. At this time, a drinking song was sung. It was popular because of its well chosen words, tone, the accompaniment of table banging, and stamping of feet, with a rhythm, and an energy that made glasses jump and dishes to break, finishing of course with shouts for more to drink! 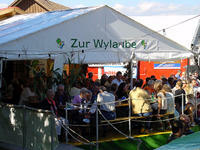 Winzerfest. Weinfest. Traubenfest, Winzerumzug, Winzerfestzug, Weinkönigin. 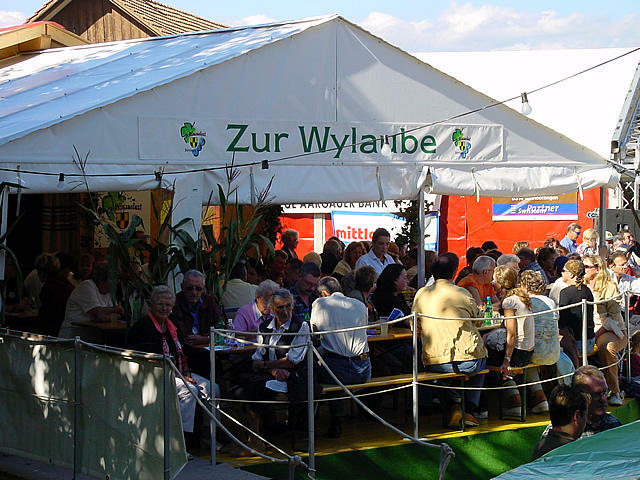 Vintners' festivals exist in many German and Swiss wine producing towns and villages. In both countries, these festivals bring the whole community together to celebrate work well done and accomplished, and can also be enjoyable fund-raising events, serving some community purpose -- e.g. in Efringen-Kirchen (Germany), towards new church bells and post-War rebuilding, in Döttingen (Switzerland), a donation to a children's home. Das erste Winzerfest in Efringen-Kirchen fand 1950 bei der Turnhalle in der Nähe des Nikolaus-Däublin-Wegs statt. Es wurde gefeiert, um Geld für neue Kirchenglocken sowie den Wiederaufbau der durch den Krieg zerstörten Häuser zu sammeln. Damals wurde das Fest von der Gemeinde, den Gesangvereinen, vom Handorgelverein und dem Musikverein organisiert. Der alljährliche Döttinger Winzerumzug erfreut sich einer langjährigen Tradition. THE TUSCAN GRAPE FESTIVAL ! Have you ever taken part in a vintage? Even so in the gorgeous Etruscan Valley of Tuscany? We herewith would like to invite you to experience a very special vintage with real Tuscan flair! The event is being sponsored by the Cleveland Saxon Dance Group. Enjoy a delicious schnitzel dinner, Dobos torte for dessert. Performances by the Youngstown Saxon Culture Group and the Cleveland Saxon Dance Group. Enjoy the show and then dance all night to the sounds of Bergvagabunden. Participate in the tradition of "Grape Stealing."